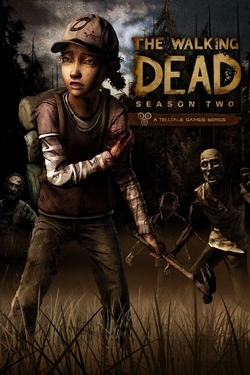 Over the years, The Walking Dead became a huge franchise spawning multiple comic issues, a TV Show and numerous video game adaptations as well, including Telltale's story-focused adventure. Season 2 of The Walking Dead picks up a while after the ending of Season 1 as you take control of Clementine, the little girl you were trying to protect during the first season. This change of character also changes the way the story unfolds because as a kid you can't be the leader of a group anymore and the world looks and feels different seen through the eyes of a kid forced to grow up faster and stand by her decisions making the entire adventure much more gruesome and unforgiving. Just like in the previous season your choices affect how the story unfolds in the end, but unlike Season 1, this season focused more on the actual characters and what they are all about, meaning there was less interactivity with the environment and the constant movement from one location to the next one makes each location meaningless, without leaving many memories or things that you were attached to in that place. Season 2 pushes the boundaries of story telling in a game even further, packing high tension moments with drama, occasional comedy and those great cliffhangers at the end of each episode, making you constantly wonder what's going to happen next and giving you some sort of ideas on who you should expect to make it out alive, without actually spoiling it for you and even better surprising you when you were wrong. The gameplay in The Walking Dead Season 2 differs very little from Season 1, borrowing some visual cues from The Wolf Among Us to make it feel more user-friendly, leaving the main things that made Season 1 so great to begin with untouched. While in Season 1 Lee's foot was bandaged pretty quickly and without showing too much this time around when it comes to bandaging a wound the game takes no step back when it comes to showing off just how harsh and gruesome the world can be seen through a kid's eyes. The rest of the game is still the same point and click open area sequence, allowing you to explore the world around you for a bit, then usually followed by a cutscene and some quick time events or a quick choice that you are forced to make in order to change the direction in which the game is headed for you in the next episode. It is once again interesting to see how much your story differs from your friends' and the fact that there are multiple endings once you reach the final moments of the season shows that the developers really meant it when they said the series adapts after your choices you make and even though throughout the first three episode that doesn't seem like a big game changer, by the end of the season, The Walking Dead manages to craft a unique story in the way you meant it when you made those choices. The graphics of this game still have the same comic book feel to them, but with the gore and violence levels turned up a little, making the experience feel like an adult focused struggle story of a young girl stuck with the entire world against her. The characters look good, but none of them are really memorable except for a couple of newcomers and some old friends. The usual problems that Telltale has are still here meaning that you will get the occasional frame rate dropping more or less depending on which platform you play on and the lip syncing is not always on spot, but these are small problems that won't affect your overall experience as you will be more interested in how the story unfolds. The first season had Lee and his deep voice that stuck with you for the course of the journey, and then there were some other characters who you could recognize instantly by the sound of their voice, but this time around it feels like the most memorable characters are actually old acquaintances like Bonnie from the 400 Days DLC and some other returning faces from Season 1, since as good as the voice acting is in Season 2, new characters lack the time and personality traits to make them feel unique and attached to your story The soundtrack is one of the greatest to date in a story-focused game, always leaving you with that perfect song at the end of each episode, making the choices you made have an even greater impact on you. After finishing this season and knowing that there are multiple endings I wanted to go back and get the other ones, but in the end I decided that I will stick with my original choices no matter how I felt about them. The games that have more than one possible outcome usually want you to play again to get another one but here's not the case. While you could get all the endings by replaying just one small part, that would mean changing the save file for that and all the achievements are already there from your first playthrough since all of them are awarded for just completing a section of an episode, so it was just more convenient to look it up online and leave my save files alone. The Walking Dead Season 2 is a good follow up to the huge success of Season 1, but in the end it felt a little weaker than before as the characters weren't as memorable as before, but the whole journey of Clementine alone is worth the purchase. If you like games where the story comes first this is the game for you; if you like zombie survival games this is also made for you, but most of all if you like Telltale Games this is definitely the game for you.